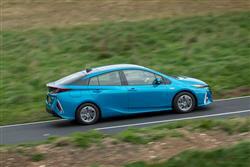 The second generation plug-in version of the Toyota Prius is a much more credible contender in the growing market for plug-in hybrid models. It can run up to 30 miles on pure electric power (twice as far as its predecessor) and EV power is up by 83% thanks to a freshly-developed Dual Motor Drive System. It's the faintly unbelievable figures though, that could sell you on this car: fancy 283mpg on the combined cycle and 22g/km of CO2? Thought so. 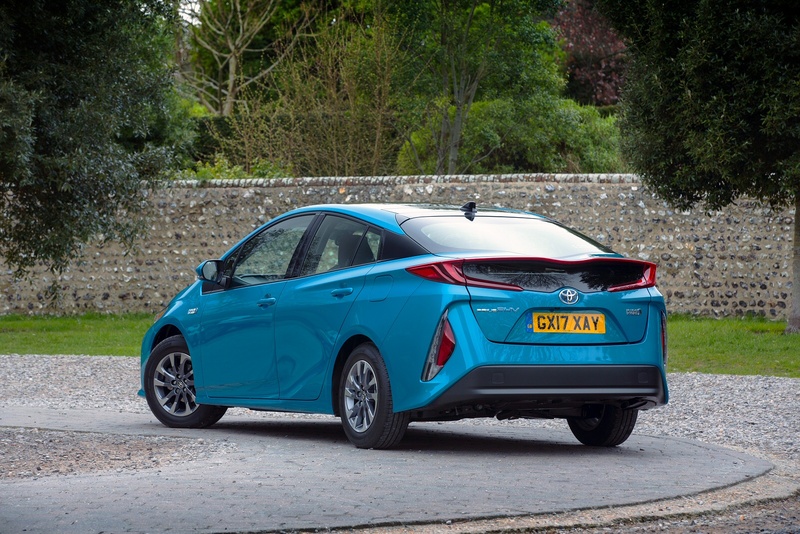 A little forgotten today is the fact that it was Toyota who were first to develop the whole concept of Plug-in hybrid motoring. 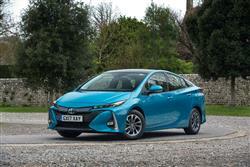 Perhaps the reason for that is that the company's initial contender in this segment, the first generation Prius Plug-in, was so relatively uncompetitive. Not only was it prohibitively expensive but it would only at best travel around 15 miles on all-electric power. Not good enough. So Toyota has gone away and come up with something better in the form of this far more competitive second generation version. This MK2 model matches the class standard for all-electric driving range and develops far more power from its larger lithium-ion battery thanks to technological improvements in three key areas: battery development, maximised EV driving performance and increased battery recharging speed. 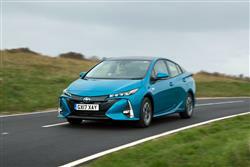 The car also handles better and looks far smarter with its second generation Prius styling. Let's check it out. Go for the standard Prius model with its old-tech nickel metal hydride battery and you'll find that it doesn't go very far on battery power alone. From start off, it's great fun to waft around in virtual silence, but you only need to have gone a mile or so down the road before the petrol engine thrums smoothly into life. This Prius Plug-in model is different. It gets a more sophisticated lithium-ion battery that can be charged from the mains, a unit that's twice as large in this second generation model, its capacity having increased from 4.4 to 8.8kWh. 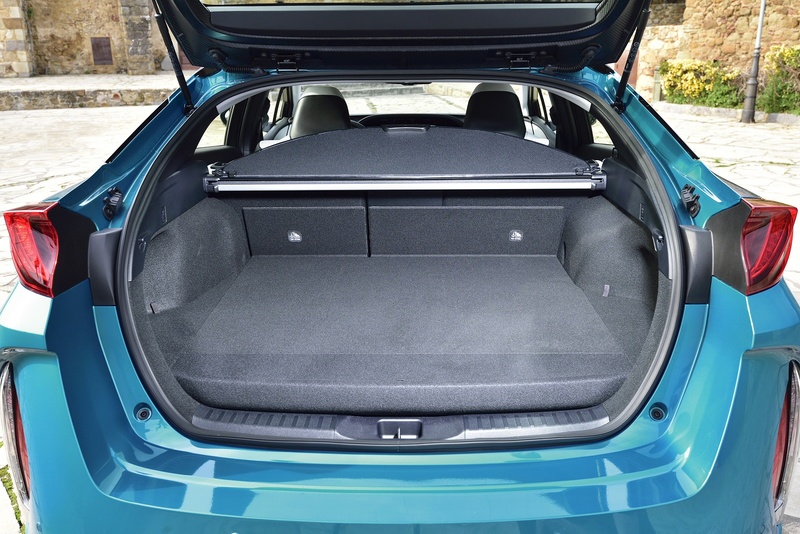 The downside of that is a 50% increase in battery weight, but thankfully, the bulk has been mounted very low down in the vehicle, which helps keep an admirably low centre of gravity. All-electric driving range is rated at around 30 miles, though you won't get anything like that if you start to really use the increased EV power of this MK2 model. This has risen by 83% thanks to a new Dual Motor Drive System that boosts EV driving power to 68kW, giving better acceleration and more engaging performance. The handling's more engaging too, thanks to this second generation design's use of Toyota's New Global Architecture platform. This stiffer set-up reduces bodyroll and improves refinement. 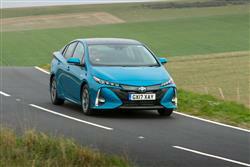 This second generation Prius Plug-in model is longer, wider and lower than its predecessor, just like the standard variant. Distinguishing Plug-in aesthetic touches include prominent acrylic grille treatment at the front and thin, ultra-compact four-LED adaptive headlamp units. In profile, this variant gets a longer rear overhang, a lower cowl and a rear spoiler, plus special two-tone 15-inch alloy wheels that are specific to the model and are designed to provide extra brake cooling. At the rear, the cross section of the distinctive Prius 'double-bubble' screen is carried through into the curve of a spoiler flanked by unique LED light clusters. 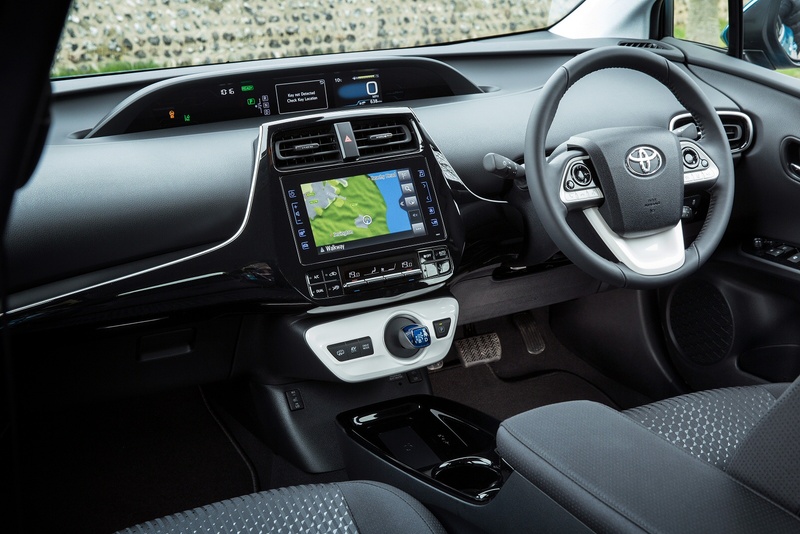 Inside, there are fewer changes over the standard Prius, though Plug-in buyers do get smarter satin chrome-plated trim, while the dual 4.2-inch TFT meter in the revised instrument panel features PHV-specific graphics. Otherwise, the dash is very similar with a clear structural arrangement of layered information which places the driver's meters at a distance and the displays closer at hand. A large eight-inch infotainment screen dominates the centre of the fascia. 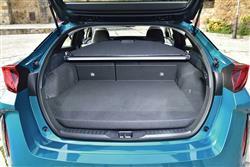 The front seats too, are shared with the conventional Prius, offering improved cushion comfort to reduce driver fatigue. 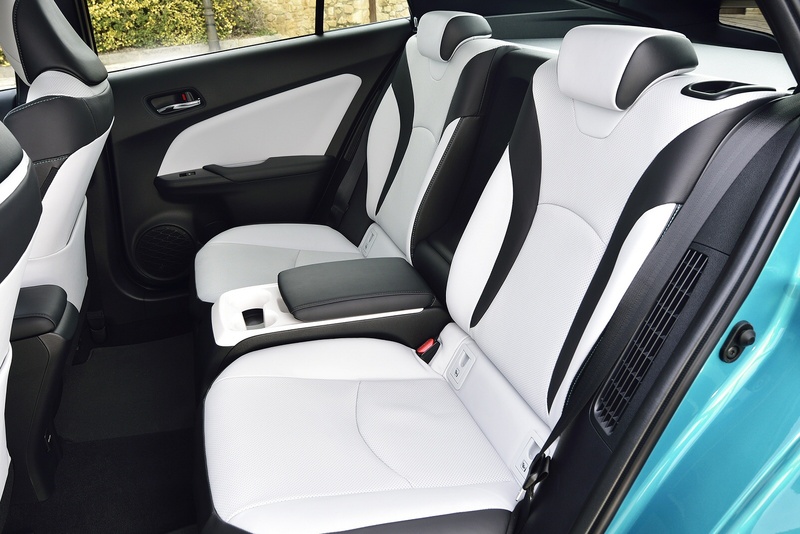 In the rear there are two seats separated by a centre console. 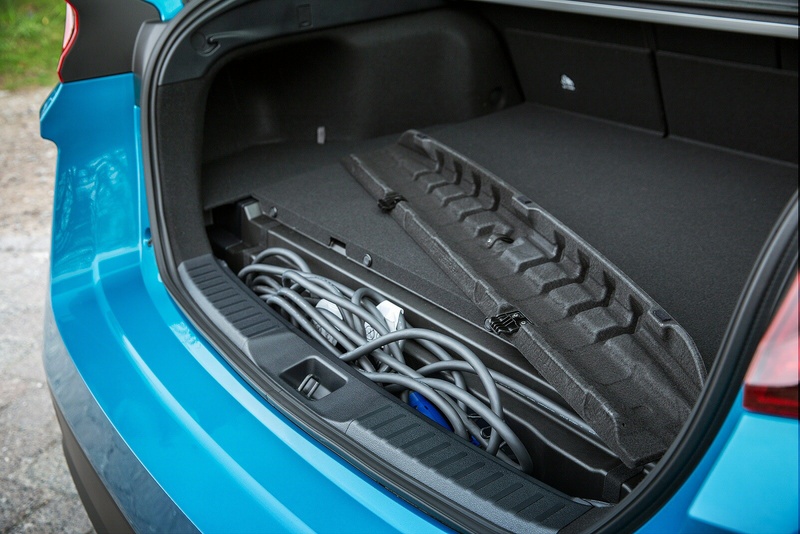 Out back, the luggage deck has been raised by 160mm to accommodate the larger plug-in hybrid system, resulting in a maximum loadspace volume of 360- litres. That's 142-litres less than you'd get in the conventional model. Expect to pay quite a premium for Prius Plug-in motoring over what you'd have to find over the conventional version of that car. We're talking around £8,000. Also making this variant look expensive is the fact that it only comes in the two plushest levels of Prius trim - 'Business Edition Plus' and 'Excel'. 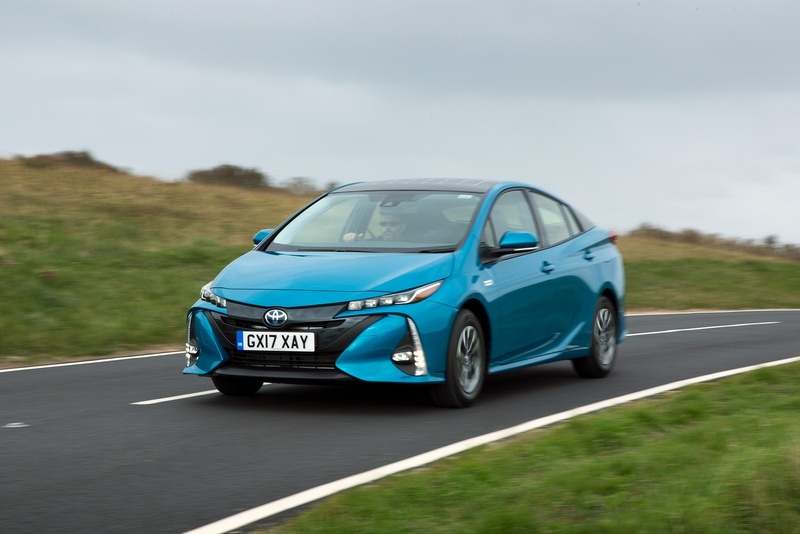 What it all means is that you'll need around £35,000 for a 'Business Edition Plus' Plug-in model - and around £2,000 more than that if you want the top 'Excel' variant. You can though, subtract the usual £2,500 Government-funded Plug-in Car Grant from those figures. At least the car will me very well equipped for that kind of money, with nearly all the executive toys you would want. We particularly like the clever gas injection heat pump automatic air conditioning system - a world first. This set-up is capable of heating the cabin without having to start the engine, even when external temperatures drop as low as -10??C. 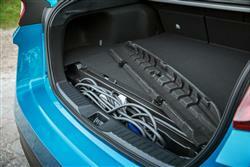 This minimises the impact heating the car's interior has on the EV driving range. The heat pump is far more efficient than engine heating or high-power electric water heaters, being able to warm the interior efficiently using heat absorbed from the outside air. The gas injection mechanism mounted on the pump gives the system its ability to operate even when outside temperatures are low. If you've had a cup of hot, sweet tea to recover from the asking price of the Prius Plug-in, the rest of this section may well help with its restorative effect. 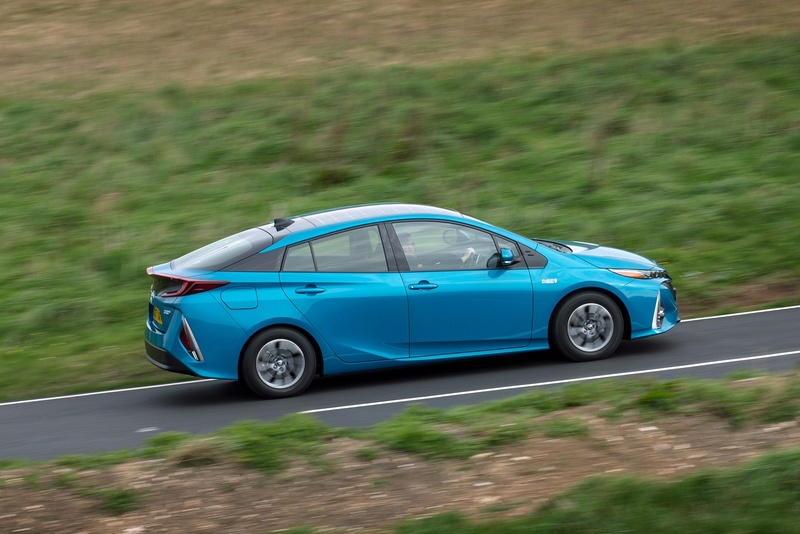 As with other plug-in vehicles, quoting a miles per gallon figure for the Prius is largely academic, because in certain scenarios the figure is effectively infinite. 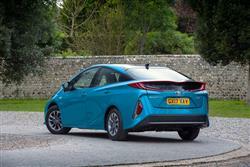 Toyota has nevertheless jumped through the hoops of the NEDC test and quotes a figure of 283mpg for this Prius. The emissions figure of 22g/km is also open to a bit of debate, but it spells free road tax and no London congestion charge, so who's arguing? Maximum charging power in this MK2 model has been increased from 2.0 to 3.3kW. The battery can be fully charged up to 65% more quickly - in just two hours using a Type II Mode III Mennekes connector, or three hours 10 minutes using a standard household plug socket. The charging process can now be programmed for a week on a day-to-day basis, including the facility to simultaneously charge the battery and pre-heat or pre-cool the cabin. Toyota has also developed solar charging panels for the roof which can charge the battery to a small extent when the vehicle is parked up in the sun. This, the company says, would increase the car's EV driving range by up to around three miles every day - the equivalent of 620 miles of all-electric driving in a year. If you�re looking for a new Toyota Prius 1.8 VVTi Plug-in Bus Ed Plus 5dr CVT [Solar roof] Hatchback for sale, you�ve come to the right place. 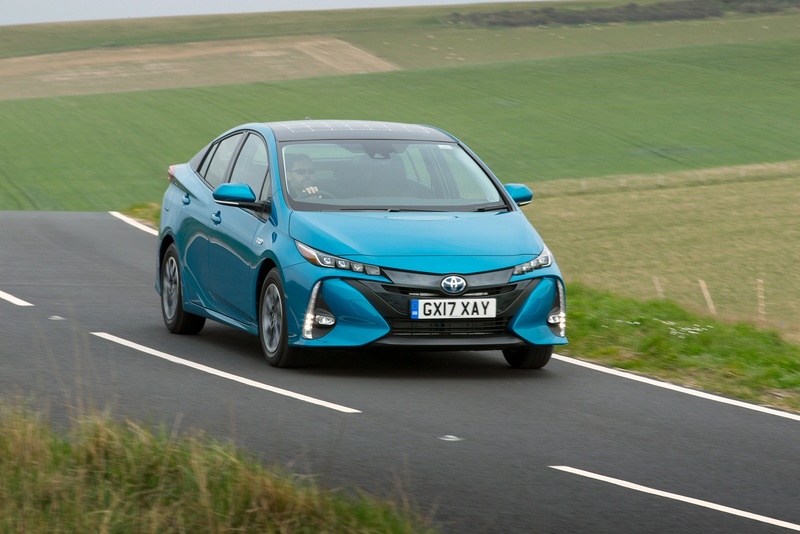 At Bristol Street Motors we don�t just have the best Toyota Prius 1.8 VVTi Plug-in Bus Ed Plus 5dr CVT [Solar roof] Hatchback deals, we also offer friendly advice and help with all your enquiries to ensure your buying experience is a happy experience.